The flag was not used at the time, or at any time, to march under, or for any other purpose,–had no political significance whatever. It was not recognized as having been adopted or used for any political purpose or adopted by any authority whatever. I doubt whether Fremont ever saw it. There never was a “bear-flag party,”–known as such party at the time. The bear flag was left at Sonoma. Neither did we march under the bear flag at any time, nor under the American flag, or any flag, till we arrived at Monterey and found the American flag flying there, and organized the California Battalion of Mounted Rifleman, and Fremont was made lieutenant-colonel in command by Commodore Stockton, who brought the first authentic news of the war with Mexico. And there we raised, and for the first time, the American flag. 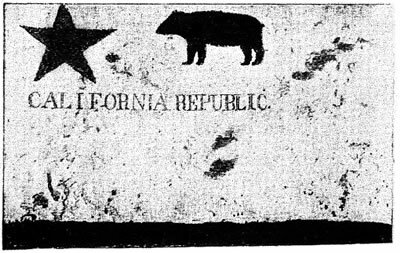 The bear flag was eventually donated to the Society of California Pioneers, who displayed in their Pioneer Hall. It was destroyed in the fire that followed the San Francisco earthquake of April 1906. A replica hangs in the Sonoma Barracks, at Sonoma State Historic Park. This entry was posted in bear flag, Fremont. Bookmark the permalink.